The masked palm civet Paguma larvata (Carnivora: Viverridae) in Japan has been phylogeographically considered an introduced species from Taiwan. 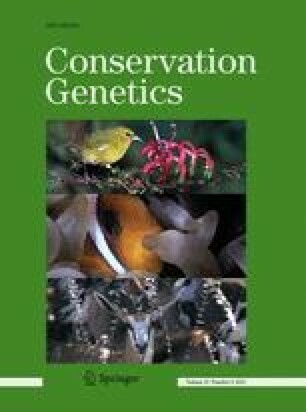 To reveal the population structures and relationships among the P. larvata populations in Japan, seven compound microsatellite loci were isolated from the genome and genotyped for 287 individuals collected from the field. STRUCTURE analysis and factorial correspondence analysis of genotyping data revealed that animals from Japan were divided into four genetic clusters. Geographic distribution of the genetic clusters partly referred to sampling areas, indicating multiple introductions into distinct areas of Japan or independent founding events leading to the generation of different genetic clusters within introduced populations in Japan. The large genetic differentiation of populations in the Shikoku District from those in other areas within Japan suggests that there were at least two introduction routes into Japan, and a possibility that some founders from areas other than Taiwan were also involved in the introduction into Japan. The genetic variation within Japanese populations were not markedly reduced compared with that of Taiwan. The results indicated that the Japanese populations of P. larvata could have retained moderate genetic diversity during founding events, because of multiple introductions, or a large number or high genetic diversity of founders. Although some individuals in Japan showed a sign of admixture between different clusters, there is no evidence that such an admixture markedly increased the genetic diversity within Japanese populations. We thank Ryosuke Kishimoto (Nagano Environmental Conservation Research Institute), Ayao Kanesawa (Ibaraki Nature Museum), Terutake Hayashi (Tochigi Prefectural Museum), Akihiro Koizumi (Iida City Museum), Midori Ogura (Karasu-gawa Keikoku Ryokuchi of Nagano Prefecture), Megumi Matsushita (Nihondaira Zoo), Tsunenori Tsujimoto (Morioka Zoological Park), Mamoru Komatsu and Katsumi Chiba (Akita Omoriyama Zoo) for supplying specimens. We are also grateful to Chizuko Nishida (Hokkaido University), Shin Nishida (Kyushu University), Tatsuo Oshida (Obihiro University of Veterinary Medicine and Agriculture) and Yu-Cheng Chang (Tunghai University) for helpful suggestions and support. This study was supported in part by a grant from the Yuasa International Foundation to R. M.